Main purpose of our "balik kampung" trip last holiday? You can say it's these. There are tonnes of photo albums in Ah Kong and Ah Mah's house. Papa wanted to scan a copy of the photos for himself to preserve the precious memories. Secondly, we had two Photobook Vouchers which had expired on 31st August 2014. Mamarazzi wrote in to them a few days before the expiry date and asked they good grace if they would help to extend the expiry date. The lady was so kind and extended the expiry date another month for us. It was mid September then. Adoi....scanning all those took very long time leh. Mamarazzi told Papa to scan those relevant photos lah...but he went and try scanning ALL the photos. Tsk tsk tsk...dunno got somebody's naked photos or not... *pengsan* . Anyway....did not finish scanning la coz too many. In the end....Papa managed to make only one Photobook from the photos that he had scanned earlier on. Didn't have enough photos for the second book. There are plenty photos to be scanned but no time to finish scanning. Mamarazzi kept nagging Papa to start the photobook coz will need time to adjust and arrange the photos leh. After submitting the first photobook, Papa asked Mamarazzi if she have anymore photos to be made into photobook. That was like two days before expiry date leh. Mamarazzi said got but not time to sort out those photos leh. Need few days to sort out leh. In the end, Papa simply hentam and put in my photos. 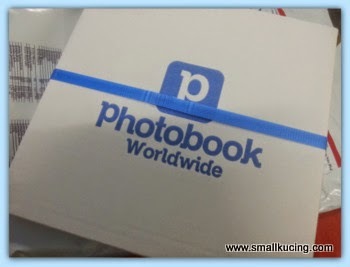 That's how I got a Hardcover Medium Photobook for myself. I super-duper love it. Wah Papa made one is nicer than Mamarazzi make ones leh. More creative. He uses a lot of Photobook Designer existing template, background, masks, frames and scrapbooks. Very cute lah. I love the way they packed the photo book. A thick cardboard box inside a plastic courier bag. 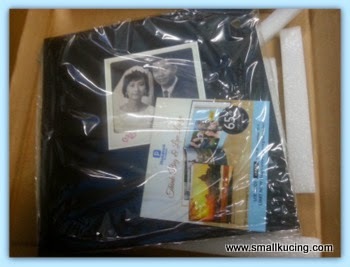 And inside the box, the photobook was totally sealed in a plastic bag. This way, there is sure less chances of it being damage en route to us. Lovely photo of Ah Kong and Ah Mah on their wedding days. 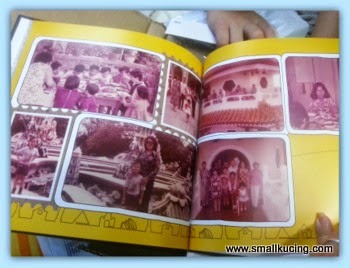 Also lovely precious childhood memories preserved in Photobook. 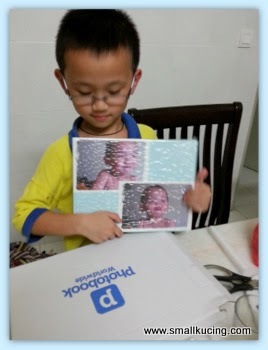 Now Papa have a copy of his childhood photos while Ah Kong and Ah Mah holds the original. Aren't this a good idea? In the old days, family usually have many kids. Well, these kids will grow up and move out of the house. So what happen to the old photos if each kid also want a copy? Best would be scan a soft copy for keepsake lor. BUT....even soft copy is not durable. Remember last time all the photo of information being store in floppy disk? Then migrated to diskette...then CD....then external hard disk ...then online....technology changes so fast. Each mode will be obselete in just a few years. For Mamarazzi, the best is still hardcopy. All sumbat into one Photobook. Mess free. Ahem ahem.....banyak Mamarazzi merapu here....you'll be thinking this is a paid post leh.. No la. Not paid post. Saja hyper coz happy with the two new photobooks received. Guess more will be coming soon when Papa finish scanning all the photos. Hahah ...back to the photo book again ! What an awesome idea! We have done this, and they are so beautiful, and so much better than a big box of pictures! Very good! That's so nice. I would love to do that too...but I'm so so so lazy. Errr call me jakun.. From last year til now, been saying I wana do the photobook but until now, same, everything saved in my phone only.. If scared phone crash, transfer into thumbdrive and safe keeping there.. haizzz.. I think I must really look into this photobook thingy seriously again..
thumbdrive also can kaput leh. fuyoh, it's definitely not a simple task to make up one photobook, somemore need converting the old photos from printed copies into softcopies!! Uncle SK can faints easily.. in fact, Uncle SK has thought of the same idea also.. get all those old photos during the film era, scan them all in, keep them in a folder in the PC, and then choose some to be put into a photobook.. but then, i won't say i'm jakun, but just malas - still now still have not done that yet.. haha!! only done those that are readily available as softcopies in my PC..
curious.. why Paparazzi cannot find enough photo to make them into a photobook?? saw lots of albums there and sure can find lots of photos to put dei.. of too lazy to scan them all and gave up half way, thought enough but when doing the photobook only realized too little photos?? oh, this time Mamarazzi has got the hardcover one.. errr, Uncle SK did a lot of photobook but all were those softcover mini 6" by 6" size, and all if not free then huge discount.. actually the mini size also quite nice, comes in handy.. but if can get the bigger ones and the hardcover ones for free, of course Uncle SK don't mind also.. hahaha!! this company very good and speedy in service leh, and the inside, wow yellow background and then all the retro feel red photos, nice!!! Papa likes hardcover better coz have a more classy look though softcover also not bad leh. Ya, scanning photos is a very good idea. My grandma has lots and lots of old photos. Good job done! Have a wonderful weekend. I go look for you, can lend me see anot? Auntie Lina doesn't even have one. Sobs. I also have so many photo albums at home. Headache. Its nice, a remembrance of life time. good idea of scanning of photos! maybe i can try to do it when i'm free! Wah paparazzi also so sentimental and also a photobook designer. Smallkucing is so lucky to get a photobook of his own. My Hubs keeps saying that people aren't going to have any pictures to remember things if they don't do a "real picture"